A crisply written detailed review! Rated full five stars. I was eagerly waiting for this review. I’ve been asking for a test drive of the Ford Ecosport S Ecoboost to the one and only Ford dealership in my town. It is already more than three months now but no luck. The car is not available till date. I’ve asked the parent branch of the dealership in Surat as well to get me a test drive but the EcoBoost was unavailable there as well. 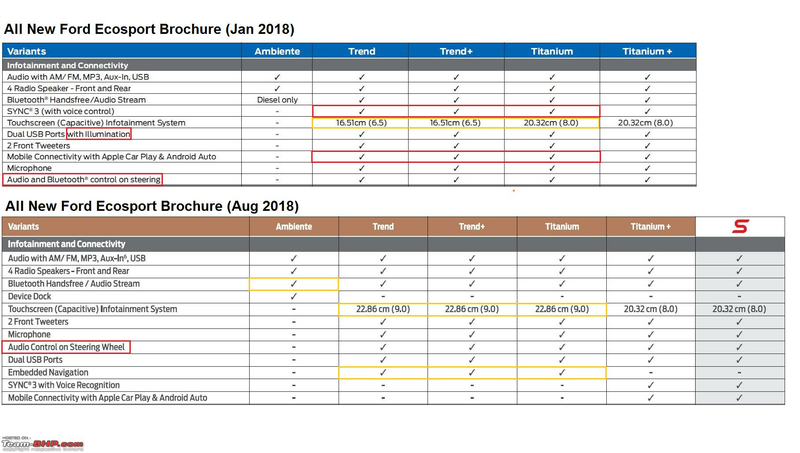 The dealerships quoted that the EcoBoost demo car is not available from the company itself and they can do nothing about it. Both the dealerships tried their best by calling me, visiting my place and insisting on me to get them the booking done. How bad or harsh is the ride compared to Nexon? Is there too much of a difference? So question to the existing Ecoboost owners - is the clutch really so hard? I was surprised as clutch was very light during another Ecosport test drive but this was Titanium model with dragon engine. I mean I found the clutch on test car more hard than on my 1.25 lakh km driven Swift diesel. The test car was just 4k kms run and it was really hard to drive it in traffic. And how much is the real world FE? My test car was showing 7kmpl. I would appreciate your inputs, as it'll help me decide if I should consider this car. I had the same experience while test driving it. And what makes it worse is the length of it. Its really long, needs deep presses and pushes back hard. Hatchbacks have much shorter, lighter clutches. IMO, for someone who is around 5'8 -5'9 - the tall seating position, long clutch, thick A pillars and the limited left side visibility will make driving in crowded situations difficult initially. That's in addition to living with the hard clutch effect on your knees. Last edited by quickfox11 : 5th September 2018 at 12:11. Much awaited review with attention to detail as usual. Being an owner, I can say that the clutch is slightly harder than my 58k kms old WagonR but cannot be called "very hard". It maybe tiresome for stop-and -go dense city traffic for longer times but I guess it will grow on you over time. I have covered around 1500 kms but my town has lesser traffic than the metros so it doesn't bother me much. As for FE, the MID shows 14.4kmpl as of now. This is after resetting on refuelling around 150kms back(before which it was showing 13.8kmpl). 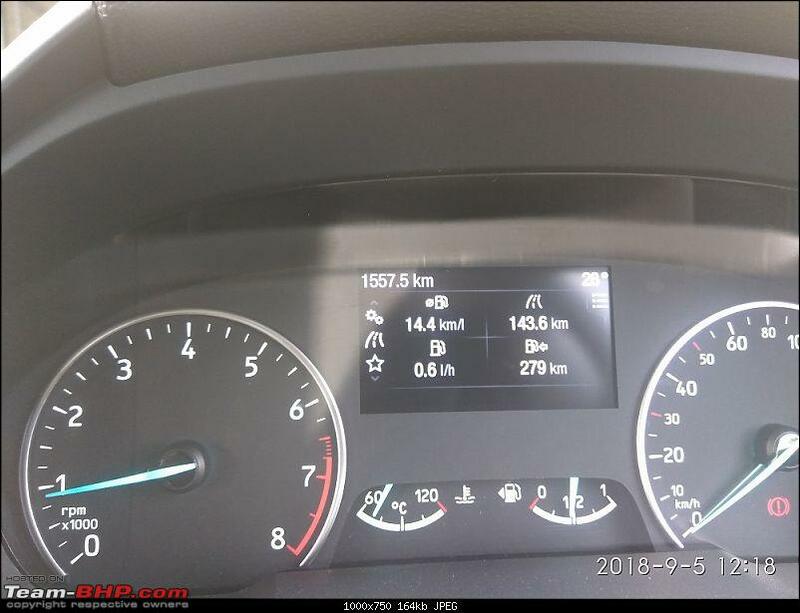 This 150kms were mostly two-way highway roads with moderate traffic and little in-town driving with AC on in auto mode for 50% of the time. I test drove the Titanium + edition about a month back - though I could not get a test drive, I spend some time inside the S and Signature versions in person. 1. The improvements in terms of the features and aesthetics are in the right direction. 2. The S version is drool worthy and I feel that they guys behind the design of S version have some taste for our likes. 3. The rear suspension - which is the most major drawback. I felt the rear seats to be better - but the suspension was still stiff like the older cars. Though the suspension in front has also improved - this is not up to the expected level of drivers confidence. Handling of course has improved which is welcome. 4. Price - the S version costs around 13.5 lakhs on the road - upgrading from the current ecosport - id rather spend that on a larger MUV, or wait for cars like Harrier to come in. However I feel the car is much ahead of what is there in the segment, but given that there are some competition building around Nexon, Brezza, and of course the Tivoli - they should have done something to the cost of the car. Last edited by peterjim13 : 5th September 2018 at 13:01. I think it has to do with the fandom for the Ecoboost. From what I understand, the Ecoboost is a famous and much sought after engine. A colleague of mine actually rushed his purchase of the pre-facelift Ecoboost variant because he believed that Ford will do away with the Ecoboost after the facelift. It's a good strategy to capitalize on the fandom of the Ecoboost - many review portals have actually been abuzz with opening remarks like "The Ecoboost is Back!". I am sure the Ford dealerships try to up-sell the Ecoboost variant to all T+ buyers. And given the amazing styling, the improved MID and the Sunroof, many people (myself included) are going for it. 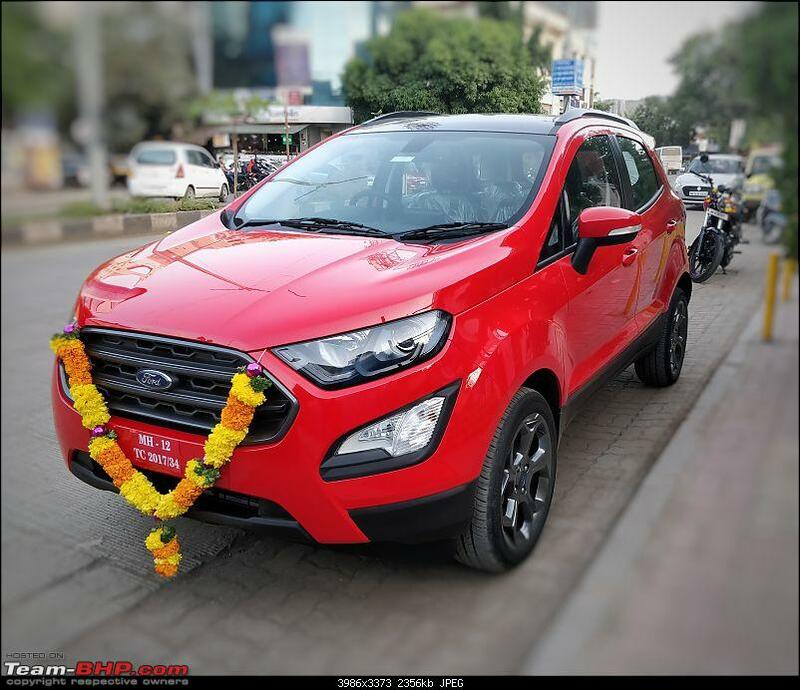 In local Facebook/Whatsapp groups of Ecosport owners as well, I have seen a significant uptick in people going for the Ecoboost variant. While looks and sunroof are a major factor, people also specifically indicate their preference for the Ecoboost engine routinely. And this despite the serious scare regarding the 17" Ecopias. I test-drove both the Nexon and the Ecosport before finalizing on the Ecosport S Petrol. Not much to separate the two of them in the suspension department would be my opinion, even though the Nexon has thicker sidewalls and 16" tyres. The reason for choosing the Ecosport over the Nexon was the way-more refined engine, better looks (personal opinion) and the better build quality of interiors (knobs, dials, push-buttons). So question to the existing Ecoboost owners - is the clutch really so hard? My FE is around 10-11 km/L on office commutes (moderate traffic but bad roads), and around 16-17 km/L on highways with low traffic. AC on in recirculation+Auto modes for a 100% of the time. It's like choosing between a rock & a hard place. If ride quality is your priority, go for the WR-V or Duster. Between the EcoSport & Nexon, I prefer the EcoSport (on 16 or 15 inchers) as I found it to be more mature. Would say that it has weight, but certainly not 'very hard'. Most owners won't complain in regular commuting. However, in bumper to bumper traffic, they might. Looking at that HighBeam picture it seems they are halogen "Yellow light" and the low beams are HID. Am I correct in my assumption ? Yes, HID Low beams and Halogen high beams. I find the diesel clutch pretty normally sprung, a little lighter than my old gen Figo actually. Also guys, although the interior bits seem 'orange' in the pics, when you actually see it, it's more of a matte bronze and actually looks pretty good. If this is becoming a deal breaker for you, I would highly suggest you see the car in person. What makes it worse for the 1.5L Dragon is that the Titanium+ loses a feature or two (TPMS which we'll miss and 17" rims which we won't). Furthermore, the Titanium loses the SYNC 3 ICE (now only on Titanium+ & S). Ford's continuous rejigging of features is damn confusing & irritating. The Titanium+ and Sports get Ford SYNC3 system with the center speaker whereas the Titanium and Signature get a 9inch touchscreen system that is different. I recalled seeing Hands-Free Telephone switches, Voice command & Sync3 on Trend & Trend+ variants at the time of launch, but in my recent visit to Ford showroom I couldn't see the same. But I thought it might just be my memory playing games with me. 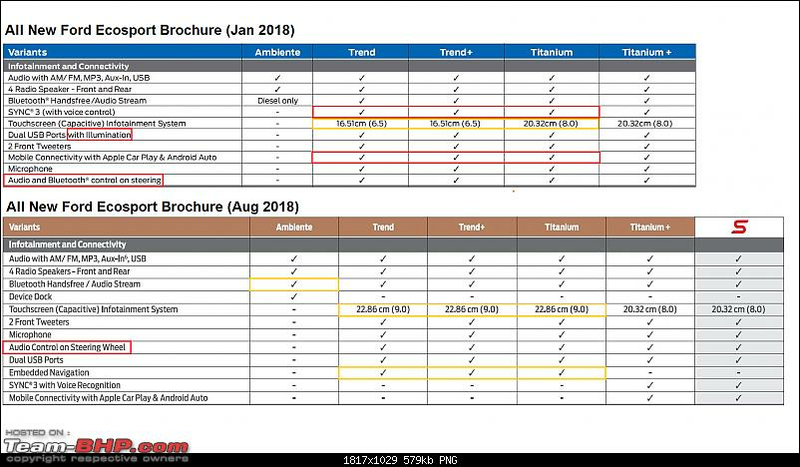 Then I saw this review and your comments; did a quick comparison of Ecosport brochure (that I had downloaded in Jan 2018) to the latest one (downloaded in Aug 2018) for infotainment section. Result : Found that my memory is still fine, it was Ford playing games with us. Seems like over-the-top cost cutting in the name of feature rationalization. And this is just one section; there may be other areas too. Why Ford why ??? Congratulations on your new car, I found the clutch to be more springy than my cousins Creta Diesel but the Dragon variant seemed better clutch wise. Last edited by Brishti : 6th September 2018 at 13:06. Yeah, photos look misleading. But as an owner I can confirm that high beams are halogen.